Daastaan Culture Lab, in collaboration with FICA, organised a four-day workshop titled ART PERFORMANCE LAB 2018: Space-Time-Body-Object and the Other(s) with Belgian artist Béatrice Didier on performance art where the participants explored the connections between space, time and body as well as their relation with other elements to arrive at an understanding of “collective performance” or what is also known in some contexts as "open sessions” or “open source”. 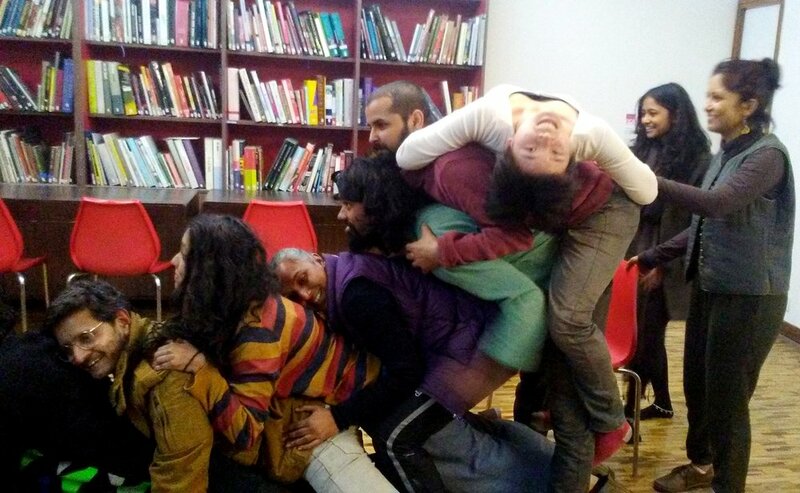 Conceptualised, designed and to be conducted by the artist herself, the workshop took place at the FICA Reading Room, S 17, Khirkee Extension, from January 10-13, 2018 from 10:30 am to 5:30 pm. The exercises were proposed not as a “method” to learn performance art but as experiences for the participants to confront themselves and explore their own ways into art performance, that is, to find their ways of “being here and now”. The exercises and experiments that Béatrice Didier proposes were mostly inspired by experimental theatre exercises by performance collective, Black Market International, and the practices of Boris Nieslony, Monica Klingler, Alastair McLennan et al. With initial sessions that focus on breathing, control energy and concentration skill, the group moved on to exercises where they explored their relationship to their immediate environment through blindfolding exercises and using found objects/materials as "partners" in the process. Image courtesy: Luis Alvarez, Into Your Arms, performance by Beatrice Didier. Beatrice Didier studied at the Conservatoire Royal de Bruxelles (Royal Theatre School of Brussels), teaching and working on several projects in performing arts. An encounter with Monica Klingler and then Boris Nieslony in 2005 brought Didier to Performance Art, which then became her principal medium of artistic creation. By practising in solo or in group, Didier has performed, taught in galleries/museums or in the context of platforms, festivals, residencies throughout Europe as well as in Mexico, China, India, Myanmar and Bangladesh. Since 2014, Béatrice Didier has exhibited her work in Performance Art at Atelier Salzamt in Linz, 10/12 in Linz and in the context of UPON festival in Chengdu. These projects brought her to create installations directly connected with her actions/ performances. Béatrice Didier is also member of PAErsche in Germany, Ricochets in Belgium and curator/ co-organiser of the platform ACTUS. Daastaan Culture Lab is an initiative of Daastaan Media Communication which aims to provide infrastructural support to communities, collectives and individuals. Under its initiatives two libraries along with activity centre have been created in Delhi and Uttarakhand. Beatrice Didier held a workshop with children on performance art focusing body-space-object. Daastaan Media Communications renewed its invitation to Ms Beatrice Didier to conduct further workshops at various level. Wallonie-Bruxelles International (WBI) is the agency in charge of International Relations Wallonia-Brussels. It is the instrument of international policy of Wallonia, Wallonia-Brussels Federation and the French Community Commission. Under agreements with 70 countries and regions, WBI supports creators and entrepreneurs of Wallonia-Brussels. WBI promotes the components of Wallonia-Brussels as entities with an international capacity for action and defends the values and interests of each party, in a spirit of cooperation and mutual assistance.